Federal officials are moving ahead with the most important potential changes in two decades in how the government asks Americans about their racial and Hispanic identity. They include combining separate race and Hispanic questions into one and adding a new Middle East-North Africa category. If approved by the Office of Management and Budget, the revisions would be made on the 2020 census questionnaire and other federal government surveys or forms. Federal statistics about race and Hispanic identity are used to enforce civil rights laws, assist in political redistricting and provide data for research that compares the status of different groups. The changes would be intended to improve the accuracy and reliability of race and ethnicity data by making it easier for people to answer questions about their identity, according to federal officials. Many people, especially Hispanics, Arabs and people of multiple origins, are unsure about how to categorize themselves on census questionnaires and other federal forms. The potential changes were published Sept. 30 by the Office of Management and Budget, which sets the standards for how federal agencies collect and publish race and ethnicity data, for 30 days of public comment. The agency will publish another notice of the results of its study and possible recommendations for change, and will seek more comments. The Census Bureau recently concluded a major test of possible revisions on its questionnaires and has begun briefing advisory groups and advocates on the results. The changes potentially would be the most important since Americans were offered the option to check more than one race box to describe themselves on federal forms. That option was approved by the OMB in 1997 and included on the 2000 census. Census forms since 1980 have asked two questions about race and ethnicity. 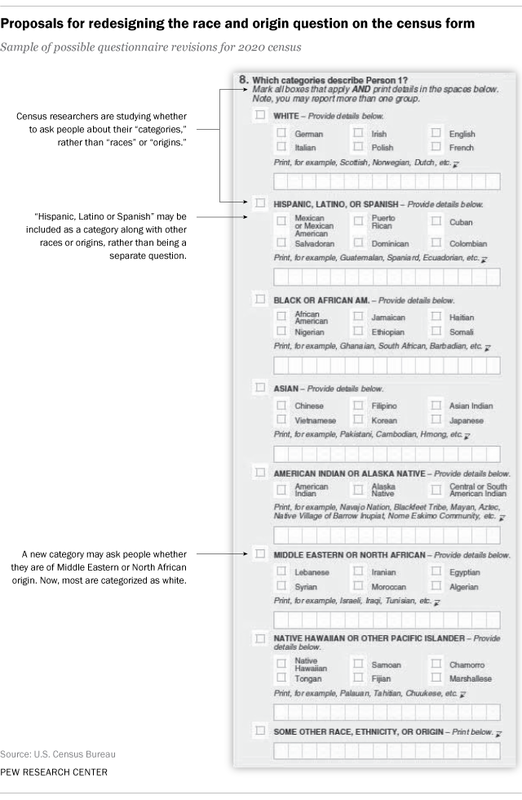 In the 2010 census, people first were asked whether they were of Hispanic, Latino or Spanish origin, and were instructed that Hispanic origins are not races. A subsequent question asked them to choose one or more of 15 options that make up five race categories – white, black, American Indian/Alaska Native, Asian, or Native Hawaiian/Other Pacific Islander. There also is a “some other race” category. A combined question would offer people all the race and Hispanic ethnicity options in one place. They could check a box to identify as white, black, Hispanic/Latino/Spanish origin, American Indian/Alaska Native, Asian, Native Hawaiian/Other Pacific Islander or some other race or origin. Under each category would be a line where people could offer more detail about their origin, tribe or race – for example, Irish, Mexican, Nigerian, Navajo or Pakistani. There might also be checkboxes for the most common options. See a timeline of the history of racial categories in the census. One goal of the combined question is to reduce the growing number of people who check no race box or check the “some other race” box rather than a specific race, in some cases because they consider their race to be Hispanic. In a presentation to advisory groups, Census Bureau officials said that in a test census of 1.2 million households last year, the combined question appeared “to elicit higher quality data” than separate questions. Also, fewer people checked the “some other race” category. In a preliminary recommendation to Census Bureau Director John Thompson, they said the combined question should be included in the bureau’s 2018 test of census operations, its last big operational test before the 2020 census itself. Some influential civil rights advocacy groups have raised concerns about whether the combined question would provide better data than the current questions, and have been waiting to see the bureau research from last year’s test census. The other major change in federal race and ethnicity questions would be to add a category for people who trace their origins to the Middle East and North Africa, who now generally are categorized as white. The category would be broader than the data collected on Arab ancestry since 1980. It could potentially include people from 19 nationalities, such as Egyptian, Israeli and Lebanese, as well as 11 ethnic or “pan-ethnic” identities, such as Kurdish or Arab. Advocacy groups have pushed the Census Bureau for a separate Middle East and North Africa category in the list of races and origins, saying it would help immigrants and others who are confused by U.S. racial categories. The bureau convened a forum last year to discuss the possible new category. In the slide presentation to its national advisory group, agency officials say the new category provides higher quality data by allowing those who identify as Middle Eastern or North African to find their specific identity on the census form. However, officials say they want to do more tests of alternatives for examples or checkboxes, including a possible “Israeli” checkbox. Census Bureau officials also have been testing whether to ask people about their “category” rather than their “race,” in hopes it would be more user-friendly, but say they want to continue their study before making a recommendation. Any proposed topics for the 2020 census must be submitted to Congress by 2017. Question wording is due to Congress the following year.